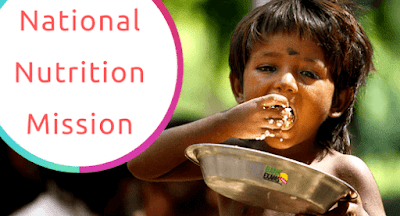 The Union cabinet chaired by Prime Minister Mr Narendra Modi approved setting up of National Nutrition Mission (NNM) with a target to reduce malnutrition and low birth weight by 2% each year with a three year budget of Rs 9046.17 crore commencing from 2017-18. Article 45 of our constitution was amended through 86th constitutional act. It changed the definition and essence of the directive principles. Earlier elementary education was under Article 45 which falls under Part 4 of the Directive Principles. In Article 45 of the constitution, it was mentioned that the states should consider providing free education to children aged between 6-14 years of age, within 10 years of promulgation of the constitution. But later in 2009, this amendment (through 86th constitutional act) was implemented and Right To education was enacted. This shifted the elementary education to Fundamental Rights- under Article 21a. Therefore then under Article 45, the states were required to take care of children aged between 6-14 years. Following similar guidelines, the National Nutrition Mission was launched. There are a number of already existing schemes like the Pradhan Mantri Matruvandana Yojana (under the Ministry of Women and Child Development) which provides support to pregnant and lactating women, Mission Indradhanush (under Ministry of Health) which seeks to increase rates of complete immunization of women and children, etc. So, there are already a number of schemes directly affecting the nutrition status of children aged between 0-6 years of age and pregnant women and lactating mothers. In spite of already existing schemes, level of malnutrition and other related problems in the country is very high. There is no dearth of schemes but there is a lack of creating synergy and linking the existing schemes to each other to achieve a common goal. National Nutrition Mission, through robust convergence mechanism and other components, would strive to create the synergy and link the existing schemes. The mission is implemented by the Ministry of Women and Child Development. More than 10 crore people will be benefited by this scheme. All states and districts will be covered in a phased manner. Currently a pilot approach is followed, i.e. first 315 worst affected districts will be targeted this financial year and later on, the mission can be spread to other areas also. The core idea behind the mission is to converge all the existing programmes on a single platform as a single Ministry working alone cannot achieve the target. It targets to bring down stunting in children. As per National Family Health Survey, 38.4% children in India have stunted growth. This Mission plans to bring this down to 25% by 2022 (Mission 25 by 2022). It targets to reduce stunting, under-nutrition, anaemia (among young children, women and adolescent girls) and reduced low birth weight by 2%,2%,3% and 2% respectively. Mapping of various schemes contributing towards addressing malnutrition. Introducing a very intense mechanism and a robust convergence action plan right up to the grass-root level. ICT (Information Communication Technology) based real-time monitoring will be done. Real-time monitoring of reports will be done that are sent by any primary health centre at the community level to the Ministry Of Women and Child Development. At the click of the mouse, the secretary in the Ministry of Women and Child Development can monitor what is the ground situation. Incentivizing States/UTs for meeting the targets. Incentivizing Anganwadi workers for using IT-based tools. Eliminating registers used by Anganwadi workers to prevent fake entries. Introducing measurement of height of children at the Anganwadi centres. Social audits to be conducted. Setting up Nutrition Resource Centres, involving masses through “Jan Andolan”. Public will be mobilized for their participation in nutrition through various activities. This will be funded by the Government Budgetary Support (50%) and 50% by IBRD (International Bank for Reconstruction and Development or other Multilateral Development Bank (MDB). MDB is an international financial institution chartered by two or more countries for the purpose of encouraging economic development. Government Budgetary support would be in a ratio 60:40 between centre and States/UTs, 90:10 for North-eastern states and Himalayan states and 100% for UTs without legislatures. IBRD is a global development cooperative bank owned by 189 member countries. As the largest development bank in the world, it supports the World Bank Group’s mission by providing loans, guarantees, risk management products and advisory services to middle-income and credit-worthy low-income countries, as well as by coordinating responses to regional and global challenges. Created in 1944 to help Europe rebuild after World War II, IBRD joined with International Development Agency to form the World Bank. They work closely with all institutions of the World Bank Group and the public and private sectors in developing countries to reduce poverty and build shared prosperity. It was established to function as a self-sustaining business and provides loans and advice to middle-income and credit-worthy poor countries.